Great baseball players are made at an early age, playing in little-league after school during the week and competing in tournaments on the weekends. And like in any sport, part of the progression towards becoming a better athlete is getting a compliment of equipment that suits your game and helps you perform. One of the pieces of equipment that can play a huge role in developing skills and performing at your best as a little-league baseball player is a bat. Youth bats are similar to their adult counterparts, but are sized and weighted for younger players. Plus, they come in a range of sizes since little league players will inevitably grow throughout their career and develop different bat preferences. In this guide, we’ll cover everything little-league baseball players need to know about how to choose a youth bat and review 10 of the best baseball bats for youth. One of the most important considerations in choosing a youth baseball bat is the weight of the bat. Using a bat too heavy will cause the hitter to swing too low, frequently batting foul balls and tiring the child out quickly with each swing. On the other hand, using a bat that is too light may make it easier to connect with the ball, but will dramatically decrease power so that most hits will end up as infield ground balls or short fly balls. The proper weight depends on the age, size, and muscle development of every individual child, but there are some rules of thumb to calculate appropriate bat weight. Almost as important as the bat’s weight is its length – and in general, you’ll want to consider the weight and length together when choosing a bat. Of course a longer bat will be heavier than a shorter bat, materials being equal, but the length can also affect the trajectory of a child’s swing. The shortest bat that the batter can reach fully across the plate is often best, since this provides the most controlled swing while also allowing full coverage of the strike zone. Youth bats typically are made of one of three different materials – composite, aluminum, or wood. Composite bats, which are made of carbon fiber, are often the highest-performance bats on offer but come at a significant price premium. These bats are designed to actually provide more rebound against the ball over time, and have a larger “sweet spot” and reduced vibrations upon connecting with the ball than either metal or wood bats. Aluminum bats are what most little-league players will be using. They are less expensive than composite bats and, while they decline with age, they do not have any break-in period after purchase and typically have longer lifespans than composite bats. However, they also have a smaller sweet spot and less rebound, which can reduce performance. Wooden bats are uncommon in little league play because they tend to be unforgiving – the sweet spot is tiny and swing trajectory must be nearly perfect to make the ball travel well. However, they can be good for batting practice and are as durable as any metal bat. The Ghost X Hyperlite boasts one of the highest length to weight ratios among youth bats, thanks to Easton’s exact advance carbon technology. This carbon fiber design allows the bat to be powerful, but keeps the weight of the bat head down so that it is easier to control for many young players. The -11 specification – indicating the difference between length and weight – is ideal for youth athletes. The carbon design also comes with a number of advantages over aluminum youth bats, including a larger sweet spot and improving rebound as the bat ages. However, carbon also comes at a hefty price tag – the Ghost X Hyperlite is one of the more expensive youth bats on the market. The bat is a single piece as opposed to a two-piece design, which users found reduced some of the bat’s rebound but left it feeling fairly balance between the shaft and head. In addition, the cushion on the shaft increases towards the base of the bat, which helps to minimize vibration transfer to the arms and makes the bat more comfortable overall. Combat prides themselves on making bats with oversized sweet spots, and the Maxum Senior League is no exception. Without increasing the diameter of the bat head, Combat claims that this bat offers a 20% larger sweet spot than competing bats – and players will attest to that claim being true. 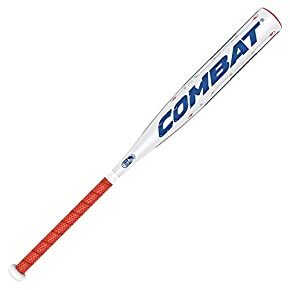 The one-piece composite design is assembled using Combat’s Pressure Molding Technology, which uses resin injection as opposed to the traditional rolling method and produces a bat head that is more consistent in performance across its face. The only downside to this method is that the bat head is heavier than in traditional composite bats. However, players find that the bat remains well-balanced and the swing feels more like holding a shorter bat due to the control it provides. Vibration transfer to the hands is somewhat higher than in other composite bats, particularly on fouled balls. The handle grip provides plenty of traction, but is thin enough that it does not provide much vibration dampening. This bat comes with a 500-day manufacturer’s warranty – nearly 2 season’s worth of time – which is one of the best warranties available for youth bats. 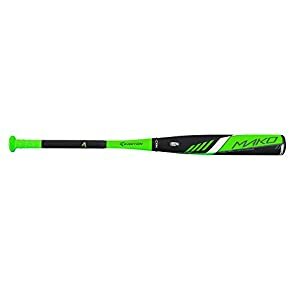 If you’re looking for a bat that prioritizes swing speed over everything else, the Mako Composite is the perfect youth bat. This bat is lighter than many other composite bats, in part because it has a slightly smaller barrel diameter – 2 ¼” as opposed to the 2 5/8” diameter found on most youth bats. This can reduce the size of the sweet spot, but allows the bat head to come off the shoulder much more quickly. And players consistently report that the bat pops just as much or more than bats with larger barrels. In addition, this bat uses a two-piece design, meaning the handle and bat head are made separately and then joined, which greatly improves how the bat head responds to torque from the handle. 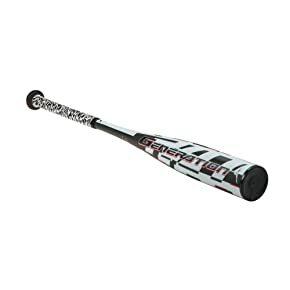 In addition, this two-piece design does a tremendous job of dampening vibrations from the bat head to the hands when connecting with the ball. The major downside to this bat is that although many players love it, they find that it lasts only one to two seasons before cracking. However, the bat comes with a one year warranty so that it is guaranteed to last at least one season. Wooden bats are relatively uncommon among youth players, since they don’t offer nearly the same ease of use as aluminum or composite bats. However, for those looking for a wooden youth bat the CU26 Pro from Marucci is a great choice. This bat is inexpensive – you can buy several of these for the price of an aluminum or composite bat – and comes with a 30-day warranty so that heavy use during the early season may be covered. The bat is extremely well balanced thanks to the fully maple wood construction, and the handle is thin enough to provide extra flex when the bat head connects with the ball. However, this can still be a difficult bat for many youth players to use since there is very little vibration dampening between the bat head and the hands, and no hand grip to provide traction. Wooden bats also typically have a very small sweet spot, which can make hitting more difficult but may be good for practicing swinging. In addition, the length to weight ratio of this bat is relatively low at -5, which can be difficult for youth players who are small for their age. The CF Zen Balanced bat from DeMarini packs a serious punch. This composite bat features a large 2 5/8” barrel and a heavy length to weight ratio of -5. While that might be too heavy for some youth players, for players who can handle a heavier bat this barrel is perfect for swinging for the fences. Everything about the bat head is designed to pack a punch, and many players are impressed by how much further the ball travels when swinging well with this bat. Part of the reason is that the heavier weight allows the bat weight to be distributed more evenly over the length of the bat, which makes this one of the most well-balanced bats on the market. The two-piece design further helps with transferring torque from the swing into energy in the barrel while at the same time drastically reducing vibration transfer back from the head to the hands. Thankfully, the two-piece design on this bat also appears to be more stable than on Easton’s Mako Composite – most players report being able to use this bat for two seasons or more without issues. Louisville Slugger has a long and storied reputation as a quality bat maker, and the Prime 916 bat doesn’t disappoint. This is one of the first three-piece composite bats on the market, and Louisville Slugger took this approach to provide serious flex between the handle and bat head. That means the barrel can act as a trampoline when it connects with the ball, making for long-hauling fly balls and fiery grounders, and leaves almost no vibration traveling back to the hands during foul balls. The Prime 916 also features a large sweet spot thanks to the bat head’s Fused Carbon Structure construction. The bat has a relatively light length to weight ratio of -12, thanks in part to using a smaller bat diameter of 2 ¼” – while this can reduce the area for the bat to connect with the ball, it also allows for greater acceleration of the bat head off the shoulder. 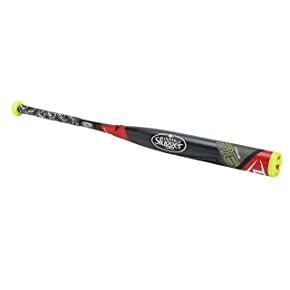 This bat is a great choice for younger players who need a lighter bat than the DeMarini CF Zen Balanced but who don’t want to give up on batting power. Plus, it comes with Louisville Slugger’s 30-day trial guarantee. The Quatro Composite bat is a great choice for youth players who need a bat that isn’t going to weight them down and that can be forgiving when hitting. This bat features an extra long barrel to handle length ratio, making it easier for batters to cover the entire plate and catch at least a piece of the ball. The -10 length to weight ratio is favored among many players as a good balance between weight and power, and the bat itself is evenly balanced despite the added barrel length thanks to the extra lightweight cap on the end of the barrel. 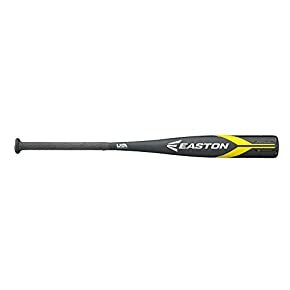 The bat is easy to bring around off the shoulder quickly and offers a solid rebound when it connects with the ball. However, players report that it is not the bat that’s going to be hitting home runs every time you step up to the plate since the ball comes off the bat somewhat slowly. The two-piece construction is sturdy – the bat should last at least two seasons – and is excellent at reducing vibrations to the hands even with the reduced shaft length. 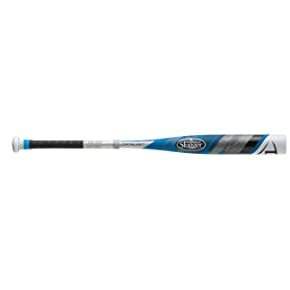 The Generation bat is Mizuno’s top of the line aluminum alloy bat for youth, and for less than half the cost of a comparable composite bat this bat still packs a punch. The most notable feature of this bat is the nearly even length and weight – the ratio is only -3. This means the bat is significantly heavier than most composite bats, but it also means that the bat weight is distributed relatively evenly across the length of the bat to produce a more balanced swing. The barrel was designed with Mizuno’s CORTECH process, which changes the thickness of the barrel wall across the center of the barrel so that the sweet spot is not only enormous, but it provides a tremendous amount of rebound for swinging big. Like most alloy bats, this one-piece design suffers from significant vibration transfer from the barrel to the hands and the rebound will decrease over time rather than improve as for composite bats. However, the bat also comes with Mizuno’s one-year warranty, so it is guaranteed to last through at least one season. This two-piece aluminum alloy bat from Axe Bat provides the best of many worlds, but really excels in the balance it provides between the shaft and barrel. The bat has a -5 ratio between the length and weight, so while it is not the lightest bat on the market it does allow the weight to be distributed evenly throughout the bat. In addition, the two-piece design provides a good amount of flex during the swing that adds to the balanced feel, increases the rebound of the ball off the bat, and reduces vibration transfer back to the hands. In addition, the custom-designed cap on the end of the barrel is lightweight and made to enhance the balance of the bat and the size of the barrel’s sweet spot. The handle also differs from most competitor bats by using a semi-pointed base and a one-sided grip that makes it both more comfortable to hold and easier to swing. 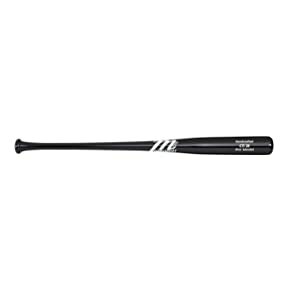 Because the barrel is made of aluminum, this bat also tends to be more durable than composite bat competitors and does not require any breaking in to get the promised pop out of the ball. 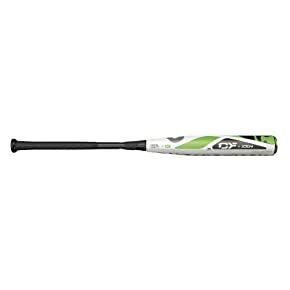 If you’re looking for a great entry level bat, but don’t want to spend hundreds on a two-piece composite or high-end aluminum alloy bat, the Catalyst from Louisville Slugger is a great choice. This bat is a one-piece composite bat, so it has many of the advantages of composite bats at a significantly reduced cost. The -12 length to weight ratio means that this bat is also one of the lighter weight bats on the market, so it’s perfect for newer youth players who need to practice controlling their swing before moving to a heavier bat. Plus, the barrel features a large sweet spot that makes it easier for inexperienced batters to hit well. The one-piece design is not as good at dampening vibration or providing a trampoline effect for the ball, so this bat may be less preferable for youth players who are looking to swing big and hit home runs. Although the overall design of the bat is very good, one common complaint is that the base of the handle flares outward, which can make it uncomfortable for younger players with small hands. Practice makes perfect, and that’s never more true than for swinging a baseball bat. Growing into a consistent, strong swing takes patience and thousands of swings – but taking tips along the way can also be a big help. For the aspiring youth player, these are some of my favorite tips. Choke up – Choking up on the bat reduces its effective length, which can make a huge difference in the amount of control you have through your swing. While choking up can reduce power, it can be a great method for extending at-bats when you’ve already got one or two strikes and would rather put the ball in play than strike out. Remember your legs – Your legs may not hold the bat, but they’re critically important to a solid swing. They’re not only your base, they’re your primary power source. Keep your legs shoulder width apart to maintain good balance throughout the swing, from start to finish, and stay on the balls of your feet rather than shifting weight backwards or forwards. In addition, use your legs to generate power when you contact the ball by rolling slightly onto the outsides of your toes. Practice bunting – Bunting is one of the best skills you can practice, because it forces you to work on hand-eye coordination in a way that is difficult to isolate during full swings. Making delicate contact with the ball requires precise bat and hand control, plus good sighting of the ball’s motion out of the pitcher’s hand. For this reason, even if you only bunt rarely during games, it can be a valuable tool to help you improve your batting all around. Getting a great baseball bat can be a big step for youth baseball players, since getting your own equipment can unlock a world of potential for improving your game and becoming more dedicated as a baseball player. There are a wide variety of baseball bats on the market, and you don’t need to spend a fortune to purchase a bat that will last years and allow your child to grow as a batter. 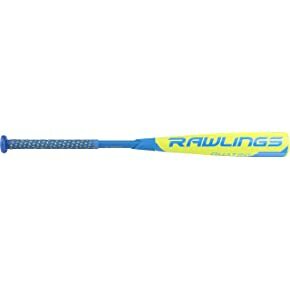 Get ready for the spring season with a new bat and watch your child start swinging for the fences!